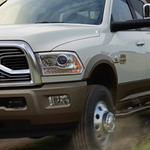 Do you need a powerful, heavy-duty pickup truck for your labor-intensive job? If you have been searching high and low for the right vehicle, search no more because you have arrived at the right place. The 2018 Ram 3500 has a set of capability features that will exceed your expectations. Your work productivity is taken to the next level because this vehicle comes equipped with a Max Tow Package that has a superior 30k hitch and a fifth-wheel or gooseneck in the bed to accommodate a 15-ton trailer home. That's right. This vehicle can tow up to 31,210 pounds with no problems, because of the rear air suspension that will level the bed of the truck for a better driving experience and less stress on the truck. We would love to show you the details of the 2018 Ram 3500 at Mojave Auto Group. Hope to see you soon!